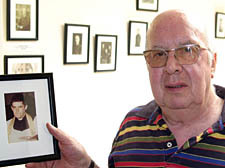 A CHURCH has recovered a photograph of a former priest it believed had been lost forever – thanks to an appeal in the New Journal. Father Alan Page was the only priest in St Michael’s 127-year history not to be included in a collection of photos of clergymen. Instead, there was an empty frame hanging from the wall at the church in Camden Road, Camden Town, where he was supposed to be. Father Page presided over the congregation for more than 25 years before moving to Wales in the mid-1990s . Church guardian Peter Deed, 70, approached the New Journal in the hope of locating a photograph of the missing priest after an extensive search in the church archives proved fruitless. “I got a call from someone called Joe who lived in Arlington Road, saying he was married in the church 33 years ago and had a copy of Alan Page in his wedding album,” said Mr Deed. “He brought it round the next morning, I got it copied and that very next afternoon it went up on the wall here – to the delight of the congregation. “We only needed one person to come up trumps.